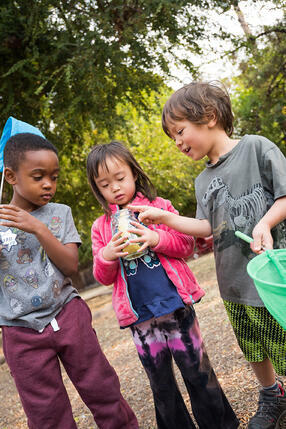 In the Early Years, children develop crucial social-emotional skills. By learning to handle themselves independently, respond to their feelings appropriately, and interact positively with others, students prepare themselves for the challenges of Elementary School and beyond. Parents can reinforce their child’s social-emotional education outside of the classroom. Here are some helpful strategies you might want to try at home with your own child. Ask – What's the problem? Using 'I' Statements – Create a poster of 'I' statements to refer to at home. For example: "I felt _____ when you _____ because _____." 'I' statements help to separate the behavior that upsets the child from the person who performs it. Mutual Mural – Decide on a theme with your child. Spread a large strip of paper on the floor or tape to a wall. As a team, create a mural based on your theme. Work together to be sure everyone’s ideas are shared and considered. Balance and Bounce – With your child, hold the corners of a blanket or sheet. Put a ball in the middle and work together to make it bounce gently up or down without it falling off. Create a Feelings Picture Book – Print or draw pictures of when we experience different feelings, and record an appropriate way to respond. Refer to this book regularly to help your child learn how to respond to the different emotions we experience. Make an Emotions Thermometer – Create an “emotions thermometer” to hang on your fridge at home. 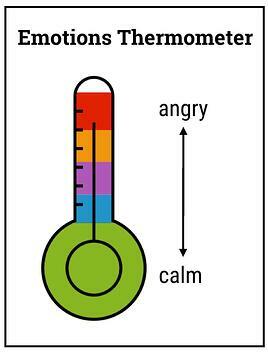 Have the thermometer range from red (angry) to green (calm). When you return home from school, ask your child to place a clothes pin on a color on the chart to assess how the day went. Read an SEL Book Together – We highly recommend the excellent book, Have You Filled a Bucket Today?, by Carol McCloud. This book promotes positive behavior by showing children how easy it can be to express kindness and appreciation. Wrestle Hug: With a big hug, encourage children to let out all the energy that is trapped inside their bodies. This helps children regulate their bodies and emotions. Lion Pose: Get on all fours and roar as loud as you can! Happy Baby Pose: Lay on back, hands to feet, big breath in through the nose, out through the mouth. Lion Pose: Get on all fours and roar as loud as you can! Happy Baby Pose: Lay on back, hands to feet, big breath in through the nose, out through the mouth. Bunny Breath: Five short breaths in through the nose, one long breath out through the mouth. Do as many times as necessary until your child begins to feel calm. 7/11 Breathing: Breathe in for 7 seconds, out for 11. Making each “out” breath last longer than each “in” breath stimulates the body’s natural relaxation mechanism.